There's never been a better time to discover the magic of Disneyland® Paris. Once upon a time is now! The treat of a lifetime for kids of all ages, Disneyland Resort Paris is the No.1 theme park in France and deservedly so because its Lights! Camera! Magic! Everywhere! All the time! 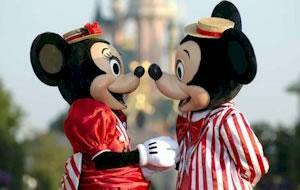 Choose whether to visit the Disneyland Park or the Walt Disney Studios. Disneyland® Paris allows you to live the magic of Disney storytelling and meet all the classic Disney characters including Cinderella, Pinocchio, Snow White and Seven Dwarfs and of course Mickey Mouse. With no less than five imaginary lands to enjoy it's a place so magical that young and old alike will remember it for ever. There is a huge variety of attractions such as Space Mountain Mission 2, Pirates of the Caribbean and the Mad Hatter's Tea Cups. And don't forget your chance to Meet 'n' Greet the beloved Disney characters. Right next door to Disneyland Park, discover the magical world of cinema and television. There are four cinemagical areas featuring thrilling attractions and spectacular shows. Explore the four studio areas, meet the Disney characters and get behind the scenes with the Parade and tours. This package also includes lunch at Planet Hollywood situated Disney® Village the perfect place to grab another slice of fun. Disney® Village buzzes with an exciting party atmosphere where families can enjoy a hearty and fun meal and even act out their favourite movie scenes. 1 day park ticket for Disneyland Paris Theme Parks (Disneyland Park or the Walt Disney Studios).